(a) Gas-phase process in which ions produced by cosmic radiation (see the illustration in figure) collide with neutral molecules in successive steps that eventually leads to the formation of gas-phase water molecules. (b) On the surface of dust grains, micron-sized silicates, for example, floating in the interstellar medium, hydrogen and oxygen atoms freeze, and a catalytic process lead to the formation of frozen water molecules. How efficient are these processes? A recent experimental measurement performed by a team of physicists at the Max Planck Institute for Nuclear Physics, Heidelberg, and the Indian Institute of Science Education and research Tirupati, showed that two major steps in the formation of gaseous water in diffuse interstellar clouds proceed faster than assumed so far. Calculations using a novel method that takes quantum effects into account are in perfect agreement with the experimental results. The new values have wide implications for the understanding of the interstellar chemistry. The study was published in Science Advances [S. Sunil Kumar, Florian Grussie, Yury V. Suleimanov, Hua Guo, Holger Kreckel, Low temperature rates for key steps of interstellar gas-phase water formation, Science Advances 4, eaar3417 (2018) doi: 10.1126/sciadv.aar3417]. From Earth, accumulations of gas and dust in space can be observed with telescopes as interstellar clouds. Despite the low temperatures and densities, a variety of molecules is found in interstellar clouds. The backbone of the cold interstellar chemistry is a network of reactions between charged and uncharged atoms or molecules. Even in the early Universe, this led to the formation of molecular hydrogen, H2. In the Universe today, ion-neutral reactions in the gas-phase lead to the production of larger molecules, from protonated water (H3O+) to organic compounds. But when one of the protonated and therefore positively charged molecules encounters an electron, it is neutralized and usually breaks up into neutral fragments. This process leads to neutral compounds ranging from water (H2O) to alcohol and sugar. It is crucial whether a collision between the reaction partners induces the reaction, because collisions are very rare in the interstellar medium. To answer this, laboratory experiments should be performed under conditions existing in the interstellar clouds. As these conditions are difficult to realize in an earth-based laboratory, present astrochemical models are mostly based on the data that have been measured at much higher temperatures and densities, and accordingly are only of limited validity. Water forms in the diffuse interstellar clouds – where reactions on the surface of interstellar dust play a minor role – via a chain of processes started by the cosmic radiation. Intermediate products are the hydroxyl ion (OH+) and the water cation (H2O+), which both react with hydrogen molecules, attaching one hydrogen atom and releasing the other one. Now, the present experiments succeeded to measure the reaction rates of these two important steps in the formation of interstellar water at low temperatures. 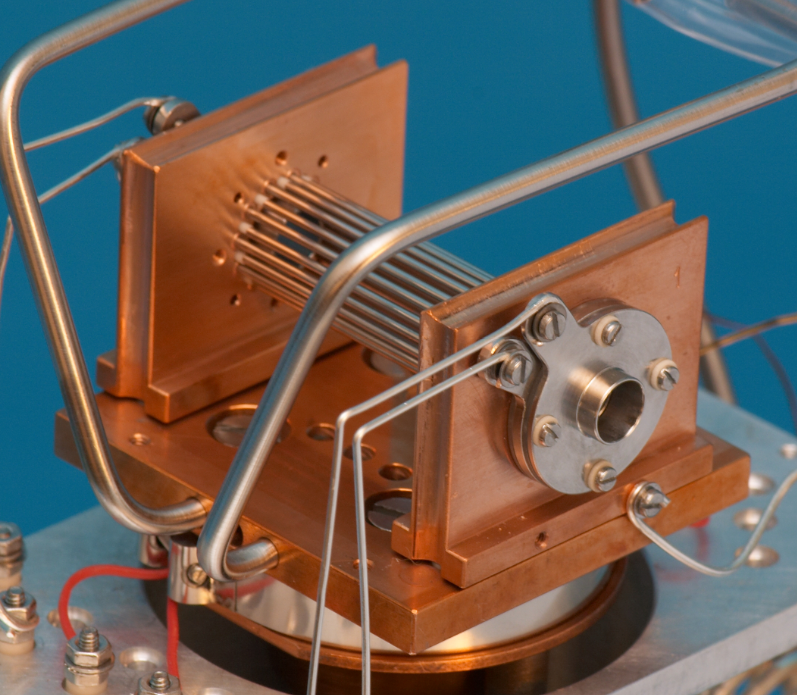 The physicists trapped the ions in a cryogenic radiofrequency multipole ion trap, in which temperatures down to 10 degrees above absolute zero are accessible. Up to about 100 milliseconds after adding a defined amount of hydrogen gas, they determined how fast the ion counts change in the trap. From this data, they derived the so-called rate coefficients which are a measure of the efficiency of the collisions between the reaction partners. It turns out that practically every collision leads to a reaction. In parallel, colleagues from Cyprus and USA performed theoretical calculations using a novel method. In an elegant way, this approach employs analogies between quantum systems and the properties of ring-shaped molecules to account for quantum effects which are particularly relevant at low temperatures. The calculated rate coefficients are in excellent agreement with the measured values. Compared to previous measurements at room temperature, the new values indicate that the reactions are considerably “faster”. 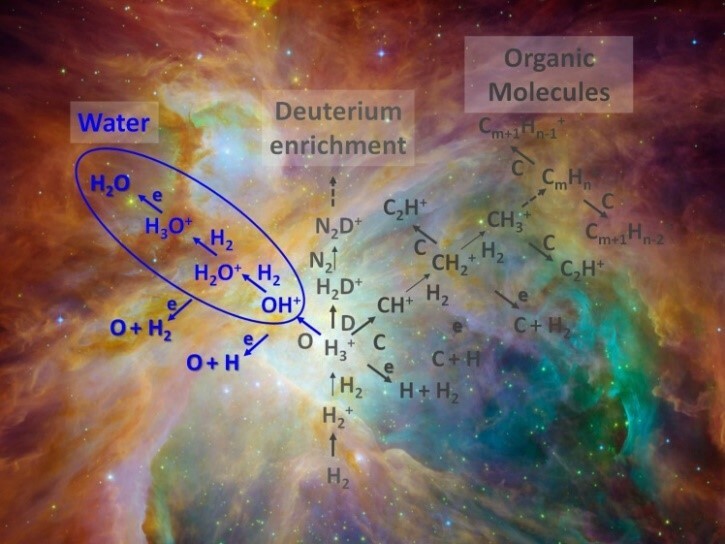 This has implications for the understanding of interstellar chemistry reaching far beyond the water formation. Since this is experimentally often difficult and time-consuming, it is important to develop theoretical procedures for reactions at these extreme conditions and to test them by means of measurements. The strength of the current work lies in the combination of experimental and theoretical methods, which are still valid at interstellar conditions.